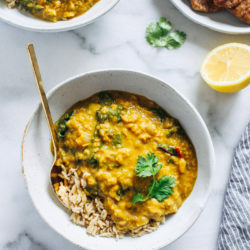 One-Pot Golden Lentil Curry- super warming and flavorful, this turmeric curry is easy to make and packed full of protein! Can easily be made oil-free. I don’t know about you guys but as soon as the cooler weather rolls in, I instantly start craving big pots of curry. 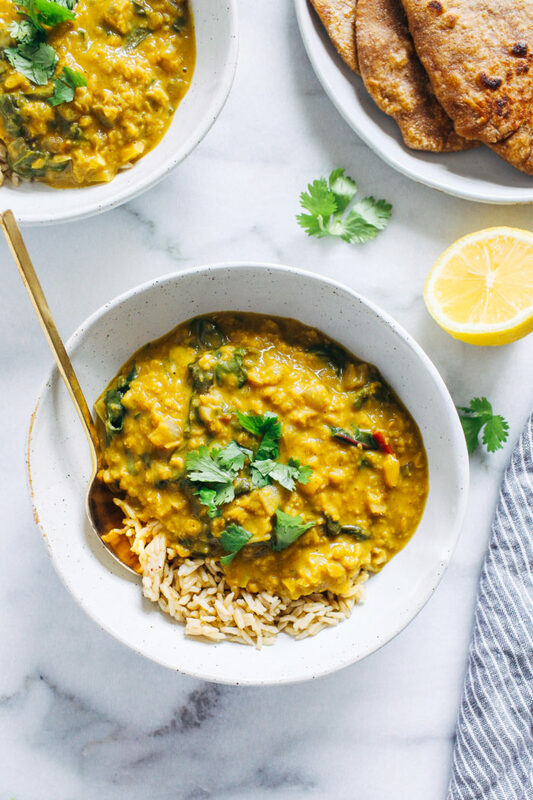 The warming Indian spices are perfect for chilly evenings and I love that you can easily incorporate whatever vegetables you already have on hand. Speaking of vegetables, if you follow me on Instagram then you might know that I’m a frequent flyer at the Athens Farmers Market. I truly believe that supporting local farmers is one of the most important things we can do to help our local communities and ensure the sustainability of our food. Not only is it healthier for the environment but it also means that we’re getting the freshest, most nutritious produce possible. Besides visiting the farmers market, another way to help support local farmers is by joining a CSA, also known as Community Supported Agriculture. Typically a group of farmers will get together and provide a weekly delivery of produce to their members which allows you direct access to high quality, seasonal produce. In return it provides consistent and reliable income to the farmers so that they can keep growing healthy food for their local community. The Full Share– the picture above is an example of what one week of a full share looks like. It includes 8 to 10 produce items and is generally enough for a family or a couple that cooks most of their meals from scratch. This share costs $30/week and offers the most variety. 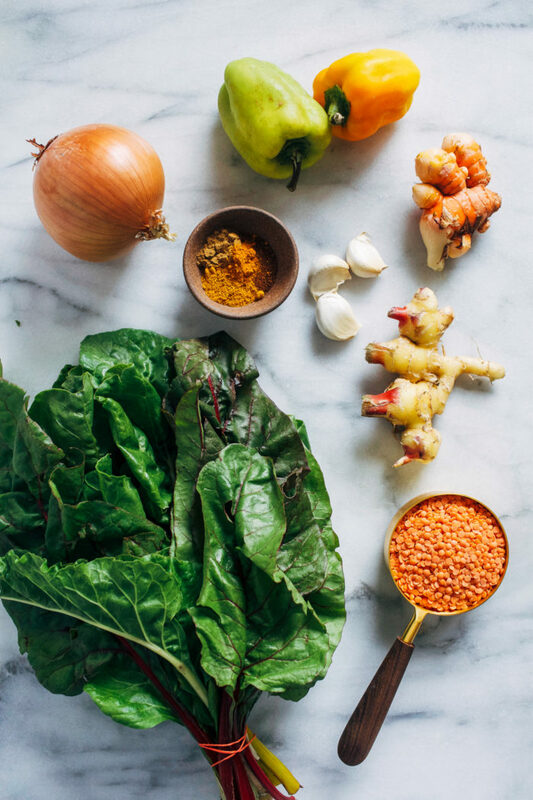 The Value Share– the Value Share is best for couples and small families that don’t cook from scratch as often or choose to supplement their CSA with produce from other sources. This share costs $20/week and includes 5 to 7 produce items each week. Like I said before, I usually go to the market because I’m a bit of a control freak and have always been nervous that I won’t know what to make if I signed up for the CSA. But I was able to try out the Full Share from Collective Harvest this past week and was really impressed with the process. They send out a newsletter a week in advance so that you know what to expect in your share and they also allow you to swap items out if there’s something you don’t like. In addition, next year they’ll have a feature that allows you to select what produce you want for the entire season so that you always know what to expect in your delivery. How cool is that?! 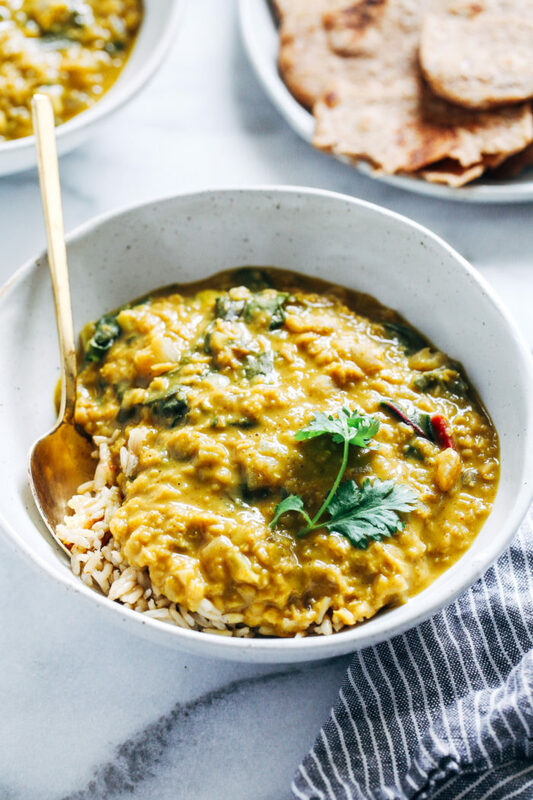 I was able to use quite a few of the items from the Full Share to make this Golden Lentil Curry, including fresh turmeric, bell peppers, and swiss chard. 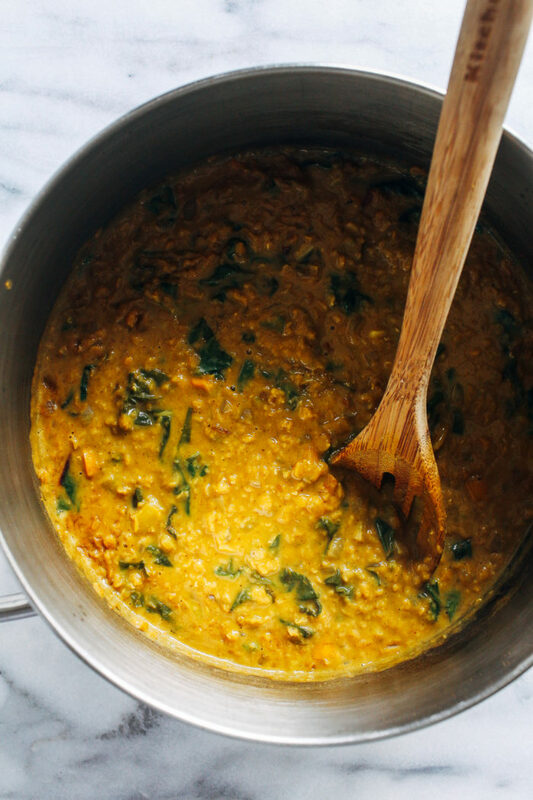 It comes together super quick in just one pot so it’s perfect for a cozy weeknight meal! If you’re in Athens then I highly recommend giving Collective Harvest a try! I’ll definitely be signing up for the Winter CSA as soon as they open registration. 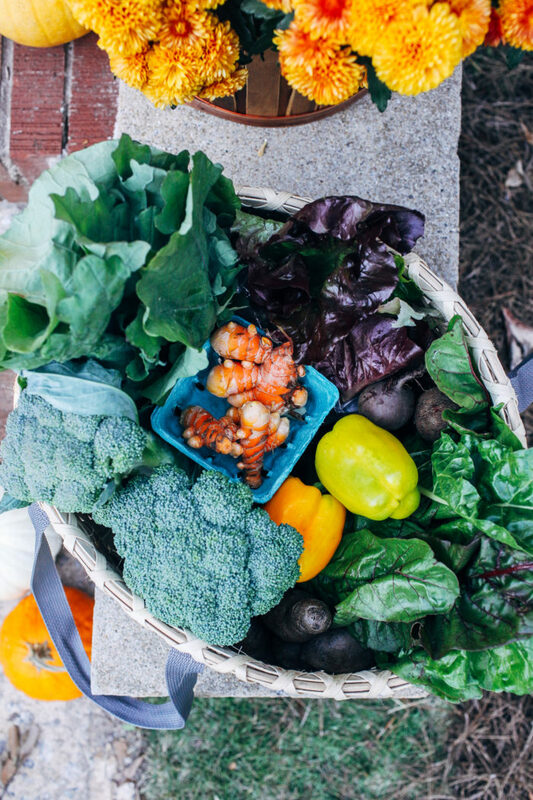 If you don’t live in Athens and want to support your local farmers, you can learn more about finding a CSA near you by clicking here. In a large pot, warm olive oil over medium heat. Add the onion and cook until translucent, for about 3 minutes. Next add the peppers, garlic, ginger, turmeric, chili powder, cumin, curry powder, salt and cayenne. Stir to combine and continue to cook for about 5 minutes. To the pot, add the lentils and vegetable broth then bring to a low boil. 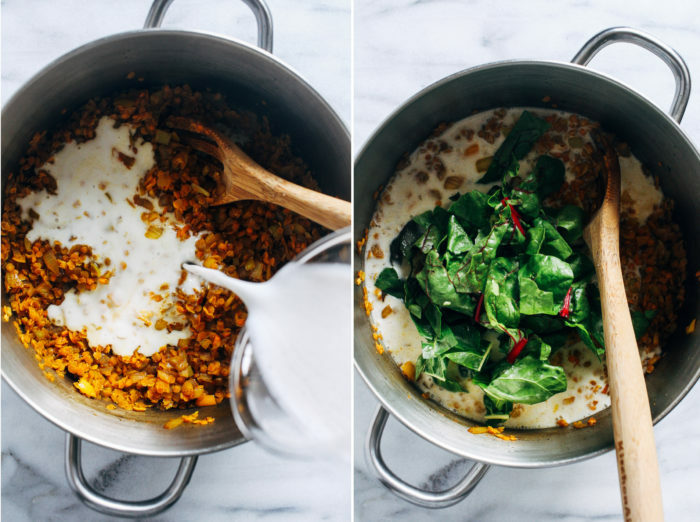 Reduce to a simmer and cook for 15 to 20 minutes, until lentils are tender. Pour in the coconut milk then stir to combine. Add the chard and continue to cook for 5 more minutes, until chard has wilted. Squeeze lemon juice over top then stir. 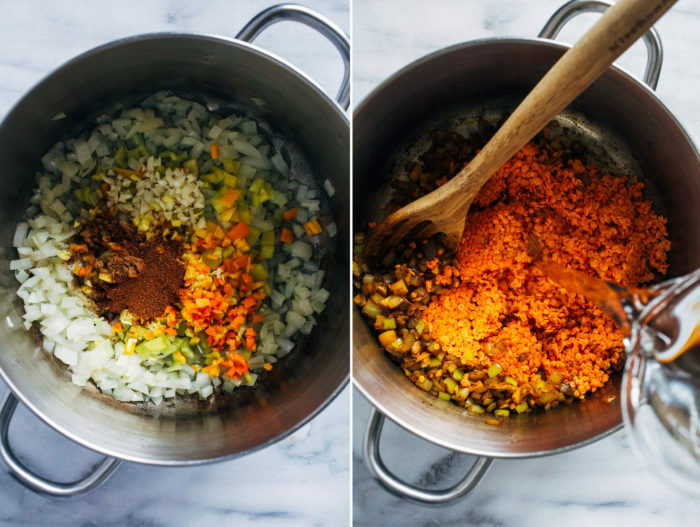 Add more seasonings to taste, if desired. Serve warm and enjoy!